VISHAY Intertechnology, represented by Braemac , has launched a new generation of RF transistors optimised to provide dynamic performance and significant space savings in TVs, VCRs, set-top boxes, and satellite systems. The new MOS transistor (MOSMIC) devices include two single MOSMICs - the S505TY and S506TY - respectively optimised for UHF and VHF amplification, and a dual MOSMIC with both UHF and VHF optimised amplifiers, the TSDF02830Y. All three MOSMICs will serve as low-noise, gain-controlled input stages in digital and analogue TV tuners. 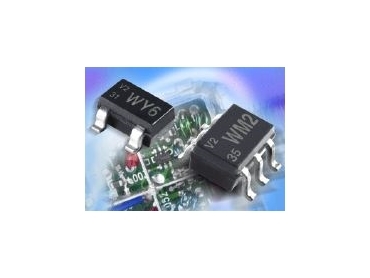 The new devices are specified for a supply-voltage range of 3V to 7V and feature a high, soft-slope AGC (automatic gain control) range to minimise noise. The S505TY, S506TY, and TSDF02830Y also provide easy Gate-1 switch-off with PNP switching transistors inside the PLL. Additional integrated features include gate-protection diodes and a partly internal self-biasing network. Typical forward trans-admittance is 31mS for the UHF optimised S505TY and the UHF amplifier of the dual TSDF02830Y. Input capacitance is 1.9pF, with a typical noise figure of 1.3dB at 800MHz. For the VHF optimised S506TY and the VHF amplifier of the dual TSDF02830Y, typical forward trans-admittance is 28mS, with input capacitance of 2.5pF and typical noise of 1.5dB at 800MHz. All three devices offer superior cross modulation at gain reduction.